BERKELEY - Two of California's most highly prized trees  coast redwood and Douglas fir  are susceptible to Phytophthora ramorum, the pathogen that causes Sudden Oak Death, University of California researchers have confirmed. Over the past seven years, Sudden Oak Death, a highly contagious fungus-like disease, has killed tens of thousands of oaks and tanoaks along the northern coast of the state. Researchers from UC Berkeley and UC Davis have isolated living cultures of P. ramorum from the branches and needles of coast redwood and Douglas fir saplings that had shown symptoms of infection. The researchers first announced the discovery of P. ramorum DNA in the trees earlier this year, but couldn't confirm that the pathogen was causing infection until living cultures were successfully grown from the field samples. It is not yet clear how seriously the disease will impact California's coast redwood and Douglas fir trees, which are ecologically and economically vital to the state, particularly to the timber, nursery, landscape and construction industries. Read the California Oak Task Force's list of Frequently Asked Questions about the disease. The infected redwood saplings were found at Jack London State Park in Sonoma County and Henry Cowell State Park in Santa Cruz County. The infected Douglas firs were found at another site in Sonoma County. The researchers also conducted DNA tests on diseased sprouts growing from the base of mature redwood trees in Marin, Alameda and Monterey counties. The presence of the pathogen in the sampled trees has been strongly suggested by repeated positive DNA identification. These new test results will be published online in October in the journal Plant Disease. The number of identified species susceptible to the Sudden Oak Death pathogen has steadily grown since the disease was first reported in Marin County in 1995. With the addition of coast redwood and Douglas fir, there are now 17 known species worldwide susceptible to P. ramorum. Sixteen of them are found in California, including the madrone, bay laurel and buckeye. One additional host species, viburnum, has been found only in Europe. "It seems that some species are able to tolerate the pathogen better than others," said David Rizzo, associate professor of plant pathology at UC Davis. The research was a collaboration between the laboratories of Rizzo and Matteo Garbelotto, adjunct assistant professor of ecosystem science and a cooperative extension specialist at UC Berkeley's College of Natural Resources. "We see a whole range of symptoms in the field, from nasty cankers on the trunks of oaks to minor spots on the leaves of the buckeye," said Rizzo. It is unclear what the new findings mean for the health of redwoods and Douglas firs in the long run, said the researchers. "Since we have not seen evidence of disease symptoms or death from the pathogen in large, mature redwood or Douglas fir, we cannot say what the effects of the infection will be long-term," said Garbelotto. 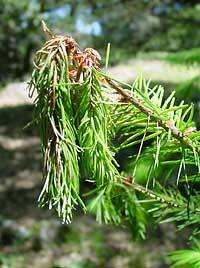 Garbelotto noted that symptoms have been detected only on the needles and very small branches of redwoods. "What was somewhat surprising is that, for redwoods, we found the pathogen in all the places we checked," he said. "In contrast, infected Douglas fir saplings were found at only one site  in Sonoma County  but they seemed to show a stronger reaction to infection. The Douglas fir saplings were right under heavily infected bay laurel trees. We don't know if there was something unique about that site that made the Douglas fir more susceptible to infection than in other areas." In addition to checking diseased trees in the field, the researchers conducted a battery of lab tests to see how P. ramorum would affect healthy trees and to confirm that the pathogen was the cause of the symptoms observed in the field. 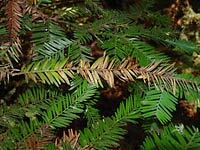 In one test, they exposed 20 redwood seedling stems to the pathogen and compared them to unexposed seedlings. After six weeks, the pathogen-exposed seedlings exhibited lesions from infection, unlike their unexposed counterparts. Branches on many of the infected seedlings became yellowed and discolored, while branches on the control seedlings retained their green color. The same series of tests were conducted for Douglas fir seedlings, which generally developed larger lesions than their redwood counterparts after exposure to the pathogen. Like the redwoods, Douglas firs that were exposed to P. ramorum developed lesions from infection. "We essentially confirmed in the lab what we observed out in the field," said Rizzo. The UC researchers say it is unclear what caused the dieback of a mature redwood tree in Mill Valley, widely reported earlier this year as having been infected by P. ramorum. Although the tree stump tested positive for P. ramorum using DNA tests, Rizzo and Garbelotto found that the tree appeared to have been plagued by three other fungal infections. "The tree had already been cut down to a stump by the time we conducted the tests, so we don't know if P. ramorum came in after the tree was cut or if the pathogen had infected the tree when it was still alive," said Rizzo. "It is impossible to say what ultimately was wrong with that particular redwood tree." The discovery of P. ramorum in the redwood  one of California's most treasured symbols  hits a sensitive chord for many in the state. The majestic trees can reach heights of more than 350 feet and live to be 600 to 2,000 years old. "It may take years before we can start answering questions about the ecological impacts of the disease on coast redwood and Douglas fir," said Rizzo. The researchers emphasize the need for further study, noting that they have only been studying the biology of P. ramorum in redwoods and Douglas firs for several months. This research was funded by the USDA Forest Service Pacific Southwest Research Station, the USDA Forest Service Forest Health Management and the Gordon and Betty Moore Foundation.